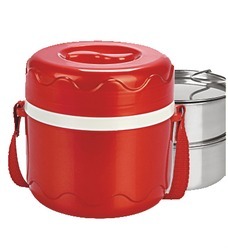 Our range of products include lunch box, magnus comfy lunch box with 3 stainless steel containers, flat lunch box with 2 containers, magnus comfy triangle lunch box with three containers, magnus comfy lunch box with 2 containers vertical type and magnus comfy lunch box with three containers vertical type. Ours is a credible name in this industry for manufacturing, supplying and exporting Lunch Box for Offices. Keeping in mind the choice and preferences of kids, these lunch boxes are manufactured by us. Developed as per the prevailing trends of the industry, our offered lunch box is available in different sizes, colors and designs. 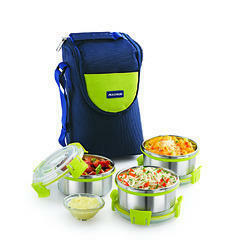 Comfy series lunch box from Magnus is of high quality and is very easy to carry. Ideal for corporate offices, schools, picnics and work. Comfy series lunch box from Magnus comes with revolutionary klip lock technology which ensures unbreakable clip function of the container and hence keeps a very long life of the entire lunch box. Airtight, Leak proof, stackable and comes equipped with a spoon and a fork. This tiffin is all you need for a very happy meal. Magnus Plastic lunch box has two airtight containers so that your food remains fresh at all times. a plastic spoon and fork is provided for ease of eating and flat lunch boxes are easy to carry in the bag while commuting. 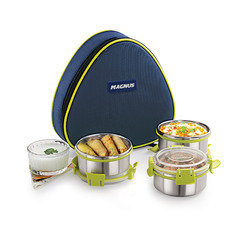 Magnus comfy triangle lunch box with three containers is a useful product. It contains three airtight, leakproof and stackable containers with unbreakable clips. Best for keeping food fresh and easy carrying to and fro from work, school or picnic. 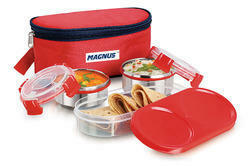 Magnus comfy lunch box with 2 containers vertical type is a smart tiffin. Easy to carry and soft in nature, this product is as useful as it gets. For a long life we have provided stainless steel containers which are airtight, spillproof and stackable in nature. Additionally we provide a pickle carrier, a spoon and a fork as a part of this product keeping in mind the end consumer. Magnus comfy lunch box with three containers vertical type, we have designed this lunch box keeping in mind the needs of the end consumer. A spoon, a fork, a pickle carrier, an easy carry belt, a handy handle and the look of a corporate lunch box. Airtight containers, leak lock containers and stackable type design containers. Easy movement of the contaienrs in and out of the lunch bag due to the design of the lunch case. Attractive colours an easy klip lock feel. A lunch box that has it all. Lunch box for corporate gifting. This has a true corporate look and is a very useful gift to your employees in office, makes their travelling easy so they reach on time. The fastest moving product in the magnus range ie. 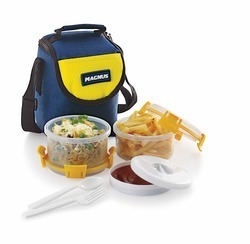 the magnus double decker lunch box with steel container. The product is highly sought after in the domestic market. 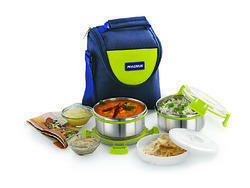 Ideal for keeping a fresh meal and easy to carry tiffin. This product is highly appreciated in the market for its innovative design and easy carrying capabilities. Apart from a airtight, leakproof container and a stackable design even on the roti box we have added additional fork and spoon for a complete meal kit. Magnus Plastic Lunch boxes are of very high quality and the containers have features like leak proof, airtight and stackable, so that food does not spill, remains fresh and one does not need to clean the bag. The bag is made of high quality material to avoid tearing, so that it lasts longer.